We were still puzzling over the event as all of a sudden the car returned. Of course, we were hard to overlook now, since Roger had fed an armful of spare wood to the fire which was now blazing waist-high. In this desolate region a nocturnal visit was quite noteworthy. Among the nomads of the deep desert a visit without prior notice to another camp after sunset is commonly considered impolite. Occasionally it can even be looked at as an act of hostility. Often I had seen nomads arriving in the night close to our campsites and keeping the obligatory distance until sunrise, before they came over to offer their greetings. Apparently at the fringes of the great deserts these things weren’t handled as tight as in the central Sand Seas. Even before we got to see the driver, Marc observed that we were to meet a gentleman with good manners. On the last hundred meters he had dipped the headlamps and had switched them off completely before he disembarked. Standing before us was a middle aged Sahrawi dressed in the traditional Daraa robe, who was visibly surprised to meet western travelers on this spot. Shy and in modern standard Arabic he greeted us, whereupon we welcomed and invited him to take a seat at the fireplace. The nightly visitor politely refused. He was looking for Mr. Abdelazizouelad whom he assumed “somewhere nearby”, as he explained. The encompassing gesture with which he underlined his assumption suggested that his concept of “nearby” was quite open to Interpretation. We could not serve with a man of this name. Instead we referred him to Mohamed and Hassan, who, however, had already gone to sleep hours ago. Our new acquaintance shook his head and repeated his question after the whereabouts of Mr. Abdelazizouelad. This gentleman was supposed to be in the area together with his camels. Camels we had seen indeed, I answered, but those had roamed driverless at the eastern finger of the valley. The looks of our visitor lit up at this disclosure: If these might have been the camels of Mr. Abdelazizouelad, he wanted to know, apparently convinced that such far-flung travelers would possess intimate knowledge of the local livestock. I denied such acquaintance, whereupon our visitor asked me another question, unfortunately my already limited command of the Arab language abandoned me in the face of this new challenge. Understanding that he must have stumbled upon a totally clueless bunch which could be of little help to him in regard to his nocturnal mission, he said goodbye, wished us a good night and departed. We continued by opening another bottle of Gerrouane, with which we intended to fight the cold of the night. 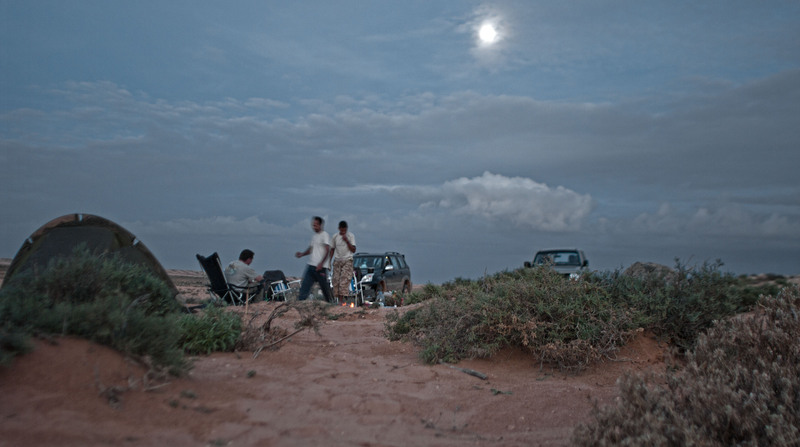 When a while later headlights appeared again at the horizon, Marc suggested to put up a counter for missing person’s reports and to post a sign reading “Information Bureau Western Sahara” at our camp. As we noticed the following day when checking the satellite chart, we had chosen a campsite located not far from the dirt road from Al Haggounia to Sidi Ahmed Laaroussi. No wonder the nightly traffic had been so busy. Because the terrain was easy, we agreed the following morning upon meeting again at noon and searching independently until then, each vehicle for its own. This way we would cover a wider area, so we hoped at least. Pjotr and I were not even an hour on the go, when I sighted a small caravan of about fifty camels and a Toyo-pickup in the binoculars. Followed by a huge dust trail Mohamed’s car appeared from the south, already heading to meet them. When we arrived a young nomad was just about to show Mohamed his meteorite finds. At that time this didn’t surprise us anymore. By now we expected every shepherd to carry at least a handful of meteorite fragments in his pockets. The boy presented a number of more or less weathered chondrites which he had found weeks earlier in the vicinity south of Tan Tan. Another fragment which the boy had discovered just days ago, not far from where we had met, caught our attention. It was a visibly unequilibrated chondrite of approximately sixty grams. The soil etch had exposed plenty of small and densely packed distinct chondrules on the fractured side. A sight which Pjotr commented with an appreciative whistle. It was definitively a fragment of a larger mass. The boy’s name was Larabas. I took down his specifications as he told us how he had found the meteorite while riding on camelback. Because this meteorite find originated from the Al Gada, our initial search area, we happily agreed to purchase it together with his other finds from Tan Tan. Larabas agreed to accompany us to the exact spot of the find. His father, however, didn’t want to have any of this nonsense because much work had to be done with the camels. By no means did he want to toil and sweat while junior was enjoying pleasant rides through the countryside …? Together with Mohamed and Hassan we spent the rest of the morning searching the specified find location for further meteorite fragments, but to no avail. After a brief lunch of canned tuna, which we took in the car because of the scorching heat, we continued our search in the afternoon together with the others. The flat plains in this part of the Al Gada as well showed a high contamination with dark weathered sandstone as well as chert debris. Dry riverbeds thickly grown with Acacia and tamarisks separated the shallow plateaus. In comparison with the other deserts I had travelled, the vegetation was luxurious. Camel thorn bushes, the bleached desert grass Stipagrostis pungens and the toxic desert melon Citrullus colocynthis were abundant. Scrubs and dead roots restricted view and complicated our search. Covered by the bushes meter-deep gullies lurked in these Wadis which were no pleasure to cross. On the plateaus we had to circumnavigate large fields of coarse debris the size of basketballs and larger. If and when we had to, we traversed these surfaces only at creep speed, fearing for our suspensions. The inhospitable terrain and a three day’s unsuccessful search had left their marks on us. Our water reserves were reduced to a critical minimum and our diesel supply, of which we had carried two dozen gallons per car in spare canisters, was down to half a tank fill. After a brief council we decided to head for the seventy kilometer distant Smara the same evening. As’Samara was founded in 1869 as a caravanserai between the oases in southern Morocco and Mauretania. Today roughly 40,000 inhabitants live in the city with Moroccan soldiers manning the important garrison accounting for a large share. 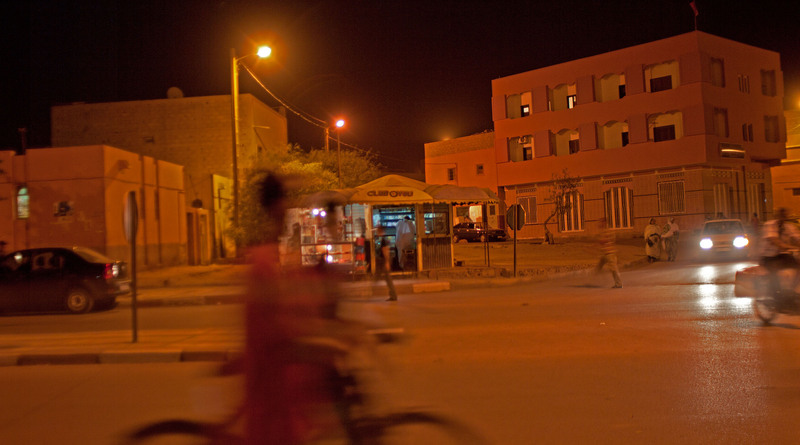 Smara is the only Western Sahara city not located on the coast. We reached the seemingly deserted place at dusk. Apart from an UN-convoy patrolling the souk, hardly anyone was out on the scorched streets. Not until two hours later did the city bustle with noise and colorful life and one could hardly find a seat in the many cafes and tearooms on the main street. There we were introduced to Ahmad, Mohamed’s smart and friendly assistant with whom I had corresponded in terms of meteorites occasionally. While Mohamed, who always took great efforts to avoid we lacked anything, went to search for our accommodation, I decided to inquire together with Marc for the coldest refrigerator in town, in order to get us a few ice-cold drinks. This was the only achievement of modern civilization which we really missed after our stay in the desert. The only hotel in the city offering running water was occupied by solvent UN-functionaries. Luckily we were invited to stay in the home of Sidi Ibrahim, one of Mohamed’s countless friends and suppliers. Ibrahim’s house was located in a quiet neighborhood in one of the side streets near the mosque. The place was nice and clean and of Spartan simplicity. As usual in the Maghreb the rooms were windowless and furnished only with carpets. Despite the late hour, temperatures inside were still a sudorific 104°F. With this in mind the common local habit to sleep on the flat rooftops made perfect sense. The toilet was a simple gap in the floor with a water hose dangling from the ceiling. The latter was instantly put into service as an improvised shower. Ibrahim, who was an excellent host, had Hassan bring us fresh goat milk and the obligatory green tea for the traditional welcome. We thanked him with little presents which we had brought for such occasions. 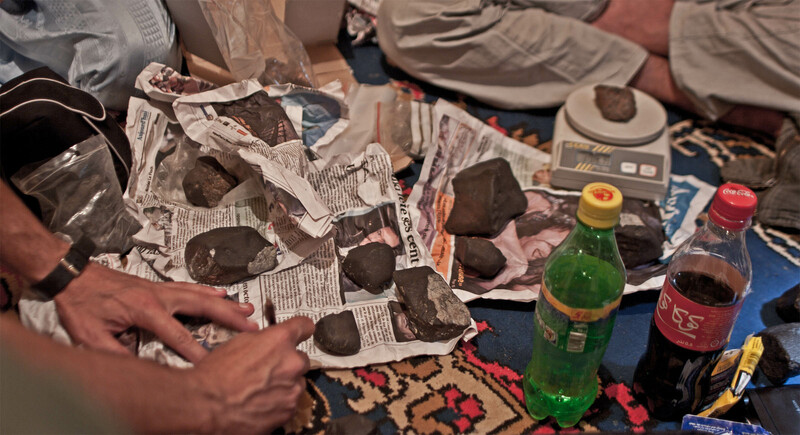 Then Mohamed and Ibrahim invited us to inspect their meteorite inventory. We didn’t need to be asked twice. Among the carefully selected material was a lodranite from Chebbi, paired with another NWA which was already published as Marc knew. There were eucrites from the Dakhla area, a massive ureilite from the Wadi Draa, and carbonaceous chondrites found in the Mauritanian Sahara. 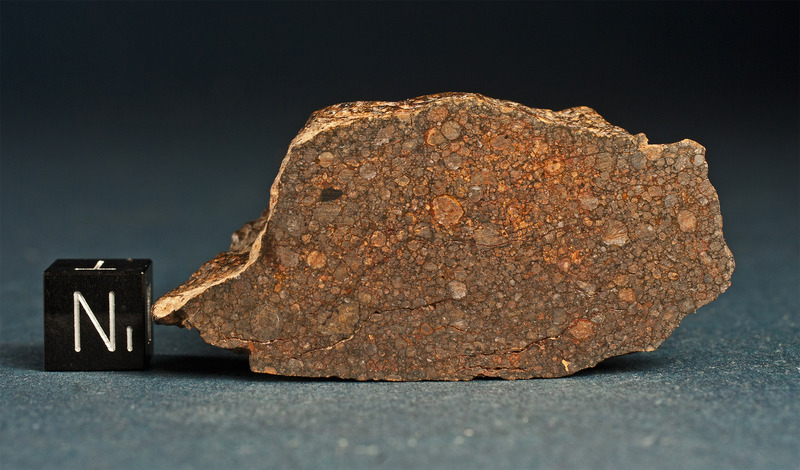 Mohamed also unveiled a number of fall-fresh chondrites recovered from the recent fall which was observed in Southern Morocco and Algeria at the beginning of May. Following the appearance of a giant bolide a meteorite shower had descended near the border of the two countries. The stones which were distributed under the names Taousz and Breja displayed a marvelous sooty fusion rind with an unparalleled contrast to the luminously bright, particularly fine grained and slightly greenish shimmering matrix. The exterior of the meteorites evoked the Moroccan falls Bensour and Benguerir, and we agreed that the chondrule lacking stones most probably represented an LL6 lithology too. Not much new information was to be learned about the recent fall event. According to the Algerian finders, the strewnfield was of limited size and extended only over a couple hundred meters. This, however, was contradicted by the progressed degree of ablation and the distinct fusion crust which coated the individual masses. A fact which rather pointed to a long independent flight of the single fragments after disruption of the main body. This in turn suggested a rather widespread distribution in a well extended strewnfield. But, with regard to the time of the meteorite fall, at 03:00 hrs local time, the eyewitness accounts were consistent. We decided to purchase an individual for scientific analysis and classification provided the finders would be asked to identify and name at least two eyewitnesses of the event and their accounts documented. Following my return to Germany I learned that Professor Albert Jambon from the Université Pierre et Marie Curie, Paris, was already working on the classification of the Breja/Taousz meteorites. Some weeks later I received the requested report collected by Mohamed on our behalf in the find region. Two Moroccan nomads, Ali Ouled Ighouat and Myara Nafii, had observed a bright bolide in the direction of Zag. To them, the fireball seemed to move roughly from west to the east. While still terrified by the sight, the two had heard a distant boom from the direction where the fireball had disappeared. The date was given as May 1st, 2010, and the time of the event as approximately 03:00 a.m. Unfortunately the location from which the meteorite fall was observed could not be determined. Far into the night we sat together equipped with strong magnifiers, cold light lamps and notebook, among these elusive envoys from far-away worlds, which had miraculously found their way into this harborage out of Thousand and One Nights. For our search in the Saquia al Hamra which we continued the following morning, our stay in Smara had not produced any new leads. All of the finds which were presented to us had been recovered from other areas. This morning we said goodbye to Mohamed, Hassan and Ahmad, who were called back to Agadir by their businesses. Their departure was regrettable. In particular Mohamed had been an excellent guide to us; through him there was a lot be learned about the country and its people. On the other hand, we were looking forward to head off now on our own. On the occasion of our departure our host Ibrahim took me aside and kindly asked if we could not send him a loupe since these things were hard to come by in the frontier town of Smara. I gladly handed him my own device. It had accompanied me the last ten years halfway around the globe, and I was convinced it would serve him well. Subsequent to the usual questioning at the checkpoint of the secret police at the exit of Smara, and after a drive of about an hour on the asphalt track towards the 240 kilometer distant El Aaiún, we reached the Gour El Berd. This was a solitary mesa of Devonian sandstone towering the Erg which extended on both sides of the road to the hazy horizon. Here we turned off the road and began to work our way through the sand and gypsum fields towards the north. The abundant plant cover of acacia and camel thorn which we were used to from the Al Gada was gone now. Instead, we rolled through a blazing bright landscape of gentle hills which rose from vast featureless sand fields.